Debating the idea of fertilizing the ocean with iron can feel a little like riding a seesaw. On the up side is iron’s eye-catching potential to set off enormous plankton blooms, triggering large reductions in atmospheric carbon dioxide. But further investigation reveals that marine ecosystems tenaciously recycle much of the carbon back into the air, rather than sequestering it in the deep ocean. Other inefficiencies and damaging side effects cut enthusiasm even more. Fertilizing the vast tracts of ocean required would be hard to achieve, making the prospect even less attractive. 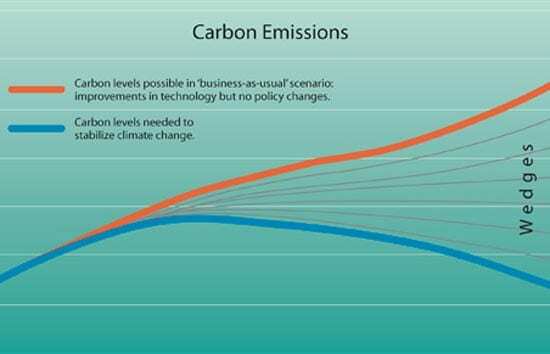 But the bottom line is buffered by an equally powerful number: the value of avoided carbon emissions. In some carbon markets, it hovers today around about $75 per ton of carbon (the equivalent of $20 per ton of carbon dioxide), but with the future likely to bring warming climate, rising sea levels, stronger hurricanes, and shifting rainfall patterns, that price is likely to increase as climate treaties mandate even stricter caps on emissions and governments institute taxes or economic incentives to reduce emissions. That incentive will draw the interest of entrepreneurs. So even if iron fertilization isn’t profitable now, it may be in coming decades. If so, several questions remain: How will fertilization schemes be regulated and how soon are they likely to become profitable? At an ocean iron fertilization conference convened at Woods Hole Oceanographic Institution (WHOI) in September 2007, economists and lawyers offered their advice. Iron fertilization is not strictly dumping under the definition of the London Convention and Protocol, Freestone said, because disposal of the iron is not the project’s expressed purpose. However, fertilization may qualify as dumping if the treaty nations decide that such projects contravene the treaties’ aims. In the Southern Ocean the legal picture is further complicated by strict laws designed to protect Antarctica, Freestone said, citing the Antarctic Treaty of 1959 and its 1991 Madrid Environmental Protocol, as well as the 1980 Convention for the Conservation of Antarctic Marine Living Resources. In any case, international treaties rely on the individual nations that sign the treaties to implement them, Freestone said. It is not unknown for entities seeking to skirt a treaty to register their ships in a nation that is not a party to the treaty or doesn’t strongly enforce its requirements. In the United States, the London Convention is implemented by the Ocean Dumping Act, Elizabeth Kim, head of the U.S. Environmental Protection Agency’s Ocean Dumping Management Program, told participants at the WHOI conference. The act governs ocean dumping of material transported from the United States; transported inside U.S. waters from outside the U.S.; and by U.S. agencies and U.S.-flagged vessels or aircraft. EPA can issue permits to dump—after careful evaluation of the need for the dumping, potential dumping sites, and the potential impacts of the dumping on the environment and other “values and uses of the ocean.” The Ocean Dumping Act includes exemptions for placement of certain materials in the ocean for a purpose other than disposal. Still, weaknesses in international laws governing the sea may be remedied by economic markets—ships that skirt international law to fertilize the ocean may find they have trouble selling carbon credits upon their return to port. More than 99 percent of carbon credits are traded under strict regulations governing how and where the work is conducted. The regulated markets arose primarily from two agreements, the Kyoto Protocol, which went into effect in 2005, and the European Union Emissions Trading Scheme, begun in the same year. The latter traded some $24 billion worth of carbon-emission equivalents last year, at an average price of around $21 per ton of carbon dioxide, according to World Bank figures quoted by Freestone. The EU Emission Trading System is a “cap-and-trade” program that assigns allowances to industries in member countries. The Kyoto Protocol assigns a maximum allowable level of emissions (about 5 percent below 1990 emissions levels) for the period 2008 to 2012 to industrialized member countries. Both schemes allow those that go under their limit to sell the remainder to those that run over. As well as letting its signatory nations trade emissions, the Kyoto Protocol includes a provision designed to help developing nations create cleaner industries. The Clean Development Mechanism allows industrialized member nations to sponsor two kinds of projects in developing nations—“source projects” that reduce emissions to the atmosphere, and “sink projects” that draw down and sequester carbon from the atmosphere—and then claim the avoided emissions for themselves. The program is regulated to try to prevent cheating and now includes nearly 800 approved projects with emissions savings equivalent to more than 450 million tons of carbon dioxide per year (123 million tons of carbon), according to Freestone. The vast majority of these projects are to reduce carbon dioxide sources; to date only one is a carbon sink project related to developing land-based forests. At present, these regulatory markets don’t allow carbon credits from iron fertilization projects or any other work conducted on international waters. But the Clean Development Mechanism is a likely model for future discussions on regulating iron fertilization projects, and its regulations offer a glimpse at the sorts of standards that will be demanded by markets allowing iron fertilization in the future. amenable to monitoring how much carbon is drawn from, and remains out of, the atmosphere. For now, iron fertilization credits would have to be sold on voluntary markets, a segment of the carbon market that is rapidly growing in pace with the public’s rising concern over climate change, said Neeff, a principal with the Global Consulting Services Group of EcoSecurities. In voluntary markets, concerned individuals and companies buy carbon credits despite having no obligation to reduce emissions. Both individuals and corporations can trade carbon credits in places such as the Chicago Climate Exchange or on Web-based sites like Terrapass and many others. The price in voluntary markets is much lower, about $3 per ton of carbon dioxide equivalent. Voluntary markets don’t have to abide by strict regulations as Kyoto projects do, and this raises fears about improper or inaccurate accounting. But they are also far smaller than regulated markets, which leaves less room for iron fertilization to become a runaway commercial success. And voluntary markets are also strongly influenced by the perceptions of a subjective buying public. For example, Neeff said, philanthropic projects—such as one that helps rural African villages achieve carbon neutrality through solar power—can fetch prices even higher than regulatory markets earn. Neeff thinks ocean fertilization projects, with their industrial tankers pumping dissolved iron into the high seas, could suffer from poor image in voluntary markets. “I take it as a given that globally we’re going to be dealing with carbon management issues for a long time,” WHOI marine policy analyst Hauke Kite-Powell told participants at the WHOI conference. “And we will probably be dealing with them in the context of some combination of policies including carbon taxes, emission caps,” and other economic incentives. Large-scale iron fertilization is unlikely to be commercially feasible unless nations start to charge carbon emitters and make room for iron fertilization in regulated markets. Otherwise, iron fertilization companies would be limited to volumes they can sell on the voluntary market, which according to Neeff traded 24 million tons of carbon dioxide equivalents (6.5 million tons of carbon) last year—less than 1 percent of the oceans’ projected sequestration potential. Even so, tens of millions of tons is equal to hundreds of millions of dollars, a strong incentive for some companies to move forward on ocean iron fertilization proposals. Presenting an economic analysis of the value of iron fertilization over the coming century, Kite-Powell formalized the seesawing relationship between the cost of carbon emissions and the true costs of conducting iron fertilization, verifying its effects, and coping with its environmental side effects. Kite-Powell’s model projected that fertilizing one-fifth of the oceans’ high-nutrient, low-chlorophyll waters each year could generate a value of $100 billion in atmospheric carbon dioxide mitigation over the next century. But that’s only if ocean iron fertilization can be shown to be effective, without significant side effects, and amenable to monitoring and verification (“auditing” in carbon credit jargon) at reasonable cost. By comparing a range of possible costs for iron fertilization with published projections of economically optimal future carbon prices, Kite-Powell arrived at an economic timetable for the iron fertilization industry and calculated its potential role in reducing net global additions of carbon dioxide to the atmosphere. When Kite-Powell entered a price on the low end of possible iron fertilization costs—$30 per ton of carbon sequestered (about $8 per ton of carbon dioxide)—his model suggested iron fertilization could be economically feasible by 2015 and could offset 100 million to 200 million tons of carbon per year—a few percent of global emissions of greenhouse gases. But the difficulties associated with monitoring iron fertilization’s effectiveness and its side effects mean the actual cost per ton is probably much higher than $30, and this would push back the date when carbon emissions prices would make it profitable. With a cost of $60 per ton of carbon, for example, Kite-Powell’s model predicts iron fertilization wouldn’t be economically worthwhile until at least 2035. And by then, with an extra 20 years of emissions collected in the atmosphere, iron fertilization’s contribution to global emissions reductions would fall. Despite the urgency of dealing with the carbon problem, Kite-Powell sees a benefit to postponing commercial implementation of iron fertilization, since the delay gives scientists time to work out the procedure’s many unknowns and regulators time to decide how to include ocean iron fertilization in carbon markets and international laws. In June 2007, the Scientific Groups advising the London Convention and the London Protocol on ocean dumping issued a “statement of concern,” taking the view that “knowledge about the effectiveness and potential environmental impacts of ocean iron fertilization currently was insufficient to justify large-scale operations.” By focusing on commercial operations, this group left open future research activities. It also has yet to define “large-scale,” which might include some research plans. The statement continued: “According to the Intergovernmental Panel on Climate Change (IPCC), iron fertilization of the oceans may offer a potential strategy for removing carbon dioxide from the atmosphere by stimulating the growth of phytoplankton and thereby sequestering the carbon dioxide in the form of particulate organic carbon. However, the IPCC also stated that ocean iron fertilization remains largely speculative, and many of the environmental side effects have yet to be assessed. The groups are continuing to scrutinize the scientific and technical bases to evaluate commercialization of ocean iron fertilization. Meanwhile, in the Jan. 11, 2008, issue of the journal Science, 16 scientists (including 13 who participated in the ocean iron fertilization conference at Woods Hole Oceanographic Institution in September 2007) published an article titled “Ocean Iron FertilizationMoving Ahead in a Sea of Uncertainty.” In it, they outlined attributes for targeted ocean iron fertilization (OIF) research programs. CLOSING THE GAP?With improvements in technology, but no changes in climate or carbon policies (the so-called ?business-as-usual? 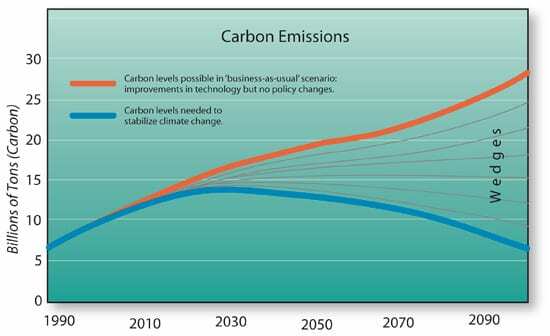 scenario), carbon emission levels are projected to continue to rise (orange line) far higher than required to stabilize climate change (blue). That leaves a large gap of excess emissions that cannot be reduced by a single method. Instead, several methods, often called wedges, will need to be combined to reach the target. Ocean iron represents one proposed way to draw down carbon from the air and store it in the sea. 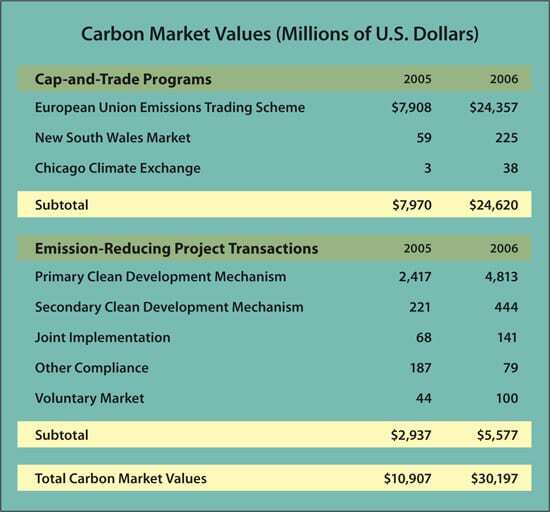 THERE?S MONEY IN CARBON?Carbon trading markets are skyrocketing, offering the potential for profits in carbon-reducing projects, such as ocean iron fertilization. Industries in countries regulated by the Kyoto Protocol or other legally binding agreements are assigned a maximum allowable level of carbon emissions each year. Those that go under their limit may sell the remainder to those that run over in carbon-trading markets. Under the Kyoto Protocol, firms in industrialized nations can receive carbon credits for financing projects for reducing greenhouse gas emission in developing countries (Clean Development Mechanism projects) or in other industrialized countries (Joint Implementation projects). In voluntary markets, concerned individuals or companies have no obligation to reduce emissions; they buy carbon offsets to assuage their conscience or make their image ?greener. ?